Thanks for selecting to assist with setting up and packing away on Sundays. Scroll on down to select your dates, but do read the information as it will (surprisingly) help. You can use the SWAP feature to amend your roster if you find you have a clash with your child's fixtures. Please note that YOU are responsible for doing this - NOT the Club. Thank you for doing your part to ensure the smooth running of the Club by turning up promptly to assist with these tasks. Please read on for specific details and duties associated with Set-up and Pack Away. Arrive at Rosalie by 7.15am. Collect the traffic cones from the wire gate sheds and make a round-about (turning circle) with 3 cones. Place two cones in the Emergency Vehicle bay to prevent Non Emergency Vehicles from parking there. Move a square table from inside the clubhouse to outside the canteen on the road side. Collect the fixtures and map board from the equipment shed and hang on wall. Collect the match card letterbox from the nets room and place on table. Collect the "Welcome to Rosalie" A-Frames from the equipment shed (roller door). Place one in front of Pitch 1 and one in the Emergency Vehicle parking bay. 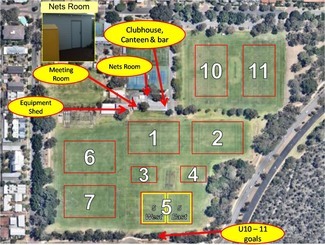 Assist with carrying goals, nets, ladders and flags to pitches, put up the nets. Nets boxes are to be stored behind the goals for the day. Ladders can be left there too. Return the square table to the clubhouse. Return the fixtures board to the equipment shed and return the match card letterbox to the nets room. Return the two "Welcome to Rosalie" A-Frames to the equipment shed (roller door). Return the two "Canteen" A-Frames to the equipment shed (roller door). Assist with taking down and returning nets and equipment. Please be careful when extracting pegs. Return all nets boxes to the nets room to the labelled shelves. Please take care to return them to their correct position. Corner flags and ladders are also to be returned to the nets room.